German Chancellor Merkel urges visiting Egyptian president to ensure constant dialogue as his country grapples with a political crisis. German Chancellor Angela Merkel urged the visiting Egyptian president on Wednesday to ensure constant dialogue as his country grapples with a political crisis that has sparked deadly unrest, AFP reported. 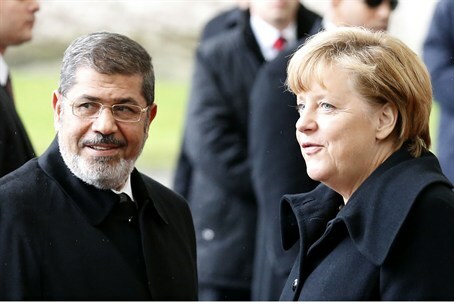 Merkel told a joint press conference in Berlin with President Mohammed Morsi that Germany wanted a successful transformation process in Egypt, where Morsi took over last year, and was ready to help. "From my side I made it clear that there are different things that are very important for us," she said, adding, "One is that dialogue with all political forces in Egypt is always available." The visit had originally been scheduled to last two days. "I am not against Judaism as a religion, I am not against the Jews who practice their religion," he said. Meanwhile on Wednesday, Mohamed ElBaradei, a leading figure in the National Salvation Front, called for talks just two days after the opposition had rejected Morsi's appeal for dialogue. The latest unrest began with protests marking the second anniversary of the Egyptian uprising, and took a violent turn at the weekend after 21 residents of Port Said were sentenced to death over soccer-related violence.